Dried pinto beans, spices and bay leaves to make Mexican-style pinto beans and refry (recipe sheet in pack). 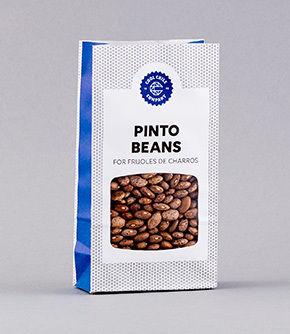 Mexican cowboy beans, known as 'frijoles de charros' are typical in north mexico, cook these beans with onions, green chilli and tomato to make this dish, or ad included sachet of smoked paprika to make refry. 250g pinto beans, 1 sachet of smoked paprika, 1 bay leaf, 1 chile de arbol and a recipe sheet. 1 and a half small onions (plus another 1 and a half if making refry later) 3 tsp vegetable oil or home rendered lard (plus 2 tbsp more if making refry later), 2 green jalapenos or similar chillies, half a tin of whole plum tomatoes or 2 fresh plum tomatoes and salt. Instructions: Eat cowboy beans as a side dish with warmed corn tortillas, or make them into refry for tortas and tacos or as a warm dip with corn chips. Mexican cowboy beans, known as 'frijoles de charros', are typical to northern Mexico.